The Nikkei index was down Monday. 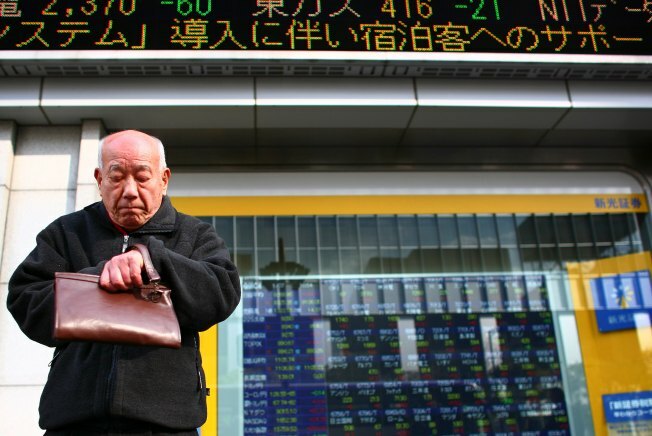 TOKYO---Stocks fell Monday in Japan, the only major Asian market open amid a slew of regional holidays, as investors braced for earnings this week from Sony, Honda and other major names. The benchmark Nikkei 225 stock average ended down 0.8 percent at 7,682.14 after tumbling 3.8 percent to a two-month low on Friday. The broader Topix index fell 0.7 percent to 768.28. U.S. stock index futures were down, suggesting Wall Street would open lower Monday. Dow futures fell 66 points, or 0.8 percent, to 7,907 and S&P500 futures slipped 9 points, or 1.1 percent, to 814.50. On Friday, investors' ambivalence about earnings reports produced a mixed performance on Wall Street, with the Dow Jones industrials falling 0.6 percent to 8,077.56, but broader stock indicators rising. Markets in Hong Kong, mainland China, South Korea, Singapore and Taiwan were closed for the Lunar New Year holidays. Australian and Indian markets were also closed for national holidays. In Tokyo, nervous investors were in no mood to buy ahead of the expected flurry of dismal third quarter results and a worsening outlook, said Masayoshi Okamoto, head of dealing at Jujiya Securities in Tokyo. "They're hanging back and trying to figure out what to do next," he said. "(Earnings) will likely be worse than anyone imagined, and investors know that the situation will deteriorate even further in the January-March quarter." Battered by a global slump, Japan's big exporters have been slashing production, earnings forecasts and jobs, and stock prices have fallen accordingly. Sony Corp., which last week projected its first annual net loss in 14 years, fell 3.1 percent. The Japanese electronics giant reports fiscal third quarter results Thursday, followed by Honda Motor Co. on Friday. But Nomura Holdings Inc., which reports Tuesday, managed to edge up 0.5 percent on hopes that in the third quarter, Japan's top brokerage had finished writing off costs related to its purchase of Lehman Brothers' operations in Asia, Europe and the Middle East. The issue rose despite weekend news reports that Nomura's October-December losses could total a worse-than-expected 300 billion yen ($3.4 billion). Among the few stock markets open in the region, Thailand's benchmark index rose 0.8 percent and the Philippines' key index was up 0.7 percent. New Zealand's market ended flat. Australia's market, closed for Australia Day, will reopen Tuesday, as will trading in India, which was observing Republic Day. Markets in Singapore and South Korea will reopen Wednesday, and Hong Kong's markets will reopen Thursday. Trading in mainland China and Taiwan will be closed all week and resume Feb. 2. In foreign exchange, the dollar was weakened slightly to 88.66 yen. The euro stood at $1.2880.